Google Reader was discontinued by Google in July of 2013. There are a variety of alternatives including Feedly, Bloglines, TheOldReader, and more (listed here). Google reader allows you to view an unlimited number of blogs (or any sites with an RSS feed) on one page. To access Google Reader, go to reader.google.com or click on 'reader' from your gmail. To subscribe to a specific blog, click 'add a subscription', paste the address of the blog and 'Add'. You can subscribe to multiple blogs at one time by importing an .opml file. To do so, click the gear and Reader settings. Then browse to find it on your computer and 'upload'. 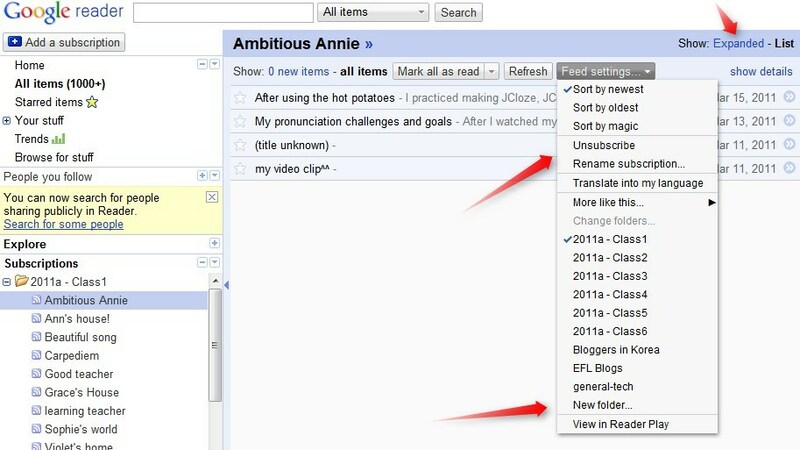 By clicking Feed settings, you can then categorize, unsubscribe, or rename individual feeds. You can also choose to list (titles only) or expand blog posts or get suggestions for other similar blogs (more like this). By clicking on a category and then Folder settings, you can rename, delete, unsubscribe, or find more blogs like those in the folder.